A 9 1/2-foot (3-percent scale) full model of the Block 1 SLS rocket goes into a shock tunnel for testing at CUBRC Inc. in Buffalo, New York. NASA engineers have teamed with CUBRC to better understand and analyze how the SLS is heated as it ascends into space. Image Credit: CUBRC Inc.
October 28, 2016 – NASA’s new rocket, the Space Launch System, will hit high temperatures as it reaches speeds of more than 17,000 mph in only 8.5 minutes. So, how does heat affect the world’s most powerful rocket for human missions to deep space, including the journey to Mars? The answer may be found in a special type of wind tunnel. NASA engineers have teamed with CUBRC Inc. of Buffalo, New York, to better understand and analyze how the SLS is heated as it ascends into space. A 9 1/2-foot (3-percent scale) full model of the initial configuration of the SLS rocket was designed and built for the first phase of aerodynamic heating tests in CUBRC’s Large Energy National Shock Tunnel (LENS-II). The initial SLS configuration will be used for the first, uncrewed flight of the SLS and Orion spacecraft in 2018, called Exploration Mission-1. Aerodynamic heating is caused by the friction between the air and the vehicle surface as it accelerates through the atmosphere. Typically, aerodynamic heating is most significant for the SLS vehicle during the second minute of flight, a time period in which the vehicle accelerates from approximately Mach 1 to Mach 4.5. 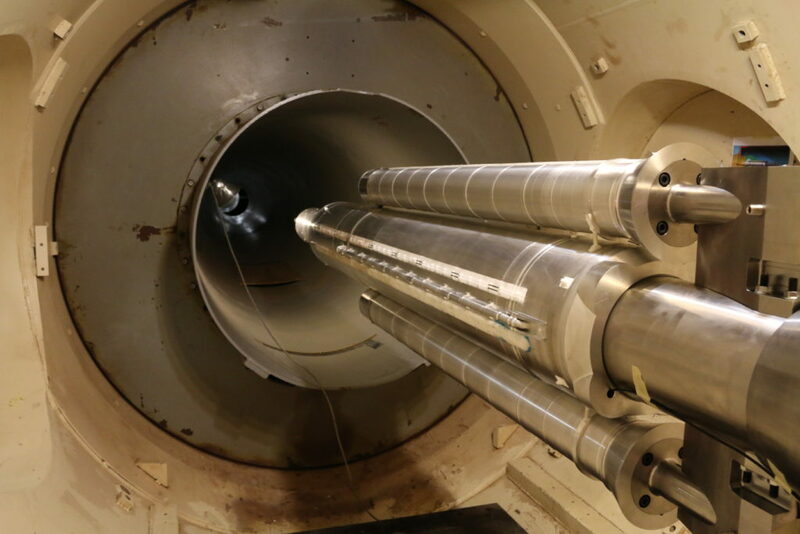 The shock tunnel generates airflow at both supersonic and hypersonic flight conditions, matching what the rocket’s environment will be like during ascent — including temperature, pressure and velocity. The tests, lasting about 40 milliseconds each, reach speeds of Mach 3.5-5. Test measurements are made in three different ways. First, pressure and aerodynamic heating are measured at nearly 200 individual sensor locations on the test model. 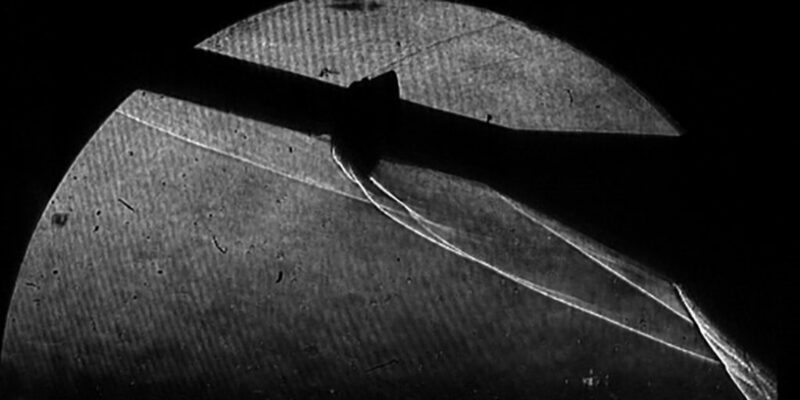 Schlieren imaging, which is an optical technique for visualizing supersonic flow around objects, also is used during the tests. Finally, temperature-sensitive paint is applied to critical regions of the test model, and is imaged during the tests to provide additional insight into the heating distribution. 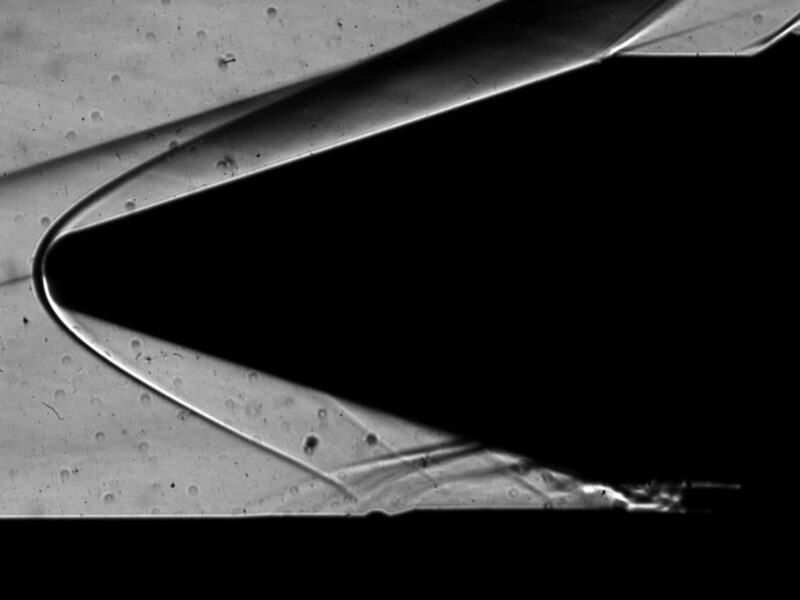 Schlieren imaging — an optical technique for visualizing supersonic flow around objects — is used during the aerodynamic heating tests. This image shows flow over Orion launch abort system at a 15-degree angle of attack. Image Credit: CUBRC Inc. The SLS rocket configuration, with boosters attached, is tested at zero and 5 degree angles of attack. In the wind tunnel, the angle of attack is the angle between the model and the oncoming airflow. At a zero degree angle of attack, the airflow is coming exactly parallel to the vehicle. The boosters are removed from the model and the remaining core stage is tested again at higher angles of attack of 15-20 degrees — an orientation observed following booster separation in nominal flight. This Schlieren image shows flow over the SLS solid rocket booster nose cone and forward attach region to the core stage. Image Credit: CUBRC Inc.
A second phase of tests will begin later this fall and use 10 1/2-foot models of the next evolution of the SLS rocket. “Both the crew and cargo configurations of the rocket will be tested, and the results will provide valuable insight into aerodynamic heating on these future versions of SLS,” Mishtawy said. CUBRC also collaborated with NASA for SLS base heating tests, which used 2 percent scale models of the rocket and propulsion systems to gather data on the heating environments that the base of the rocket will experience upon ascent for both planned and unplanned flight conditions. The initial SLS configuration will have a minimum 70-metric-ton (77-ton) lift capability and be powered by twin solid rocket boosters and four RS-25 engines. The next planned upgrade of SLS will use a powerful exploration upper stage for more ambitious missions with a 105-metric-ton (115-ton) lift capacity.